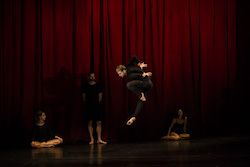 Sydney Dance Company in Rafael Bonachela's 'Frame of Mind'. Photo by Pedro Greig. 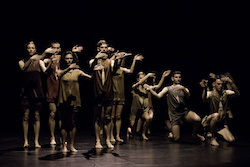 Sydney Dance Company in Gabrielle Nankivell’s ‘Wildebeest’. Photo by Pedro Greig. Under the umbrella title Frame of Mind, we were treated to revivals of two dazzling, dynamic works by Sydney Dance Company (SDC), both with astonishing, gripping choreography and sensational, sizzling dancing. This season is part of the national tour by SDC. 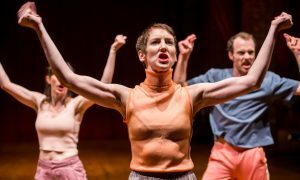 Gabrielle Nankivell’s Wildebeest began life in 2014, as part of New Breed at Carriageworks and has been captivating audiences ever since. The dancers are mysterious feral creatures that strut, paw, pose and sniff in what is possibly a forest clearing. Benjamin Cisterne’s rather ominous, moody lighting is dramatically interrupted with stormy lightning flashes and the use of strobe lighting. Luke Smile’s electronic score, with its startling, driving rhythms and inclusion of grinding noise, soaring song and stormy weather, enhances the work. Fiona Holley’s flowing costumes were in earthy, russet tones. 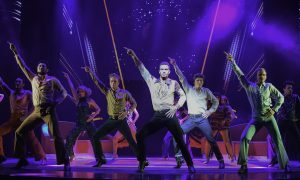 Nankivell’s choreography is performed with huge energy and is performed with glorious sizzling laser sharp lines of the body that are also fluid. There are short bursts of trios, quartets and a couple of dazzling solos. The ensemble work is tight and precise, yet there often appears to be an ‘outsider’. In one section, the dancers, rather than being wild animals, morph into a machine full of precise, controlled movement. One section features running where organised lines unpeel from a hidden centre and others cross and join in energetically. Fluid, rolling floorwork is also included. Formal, stylised choreography was contrasted with runs and some most unusual lifts. Exotic, bird-like creatures and other animals are always hinted at with hands like hooves or claws – or flowers. 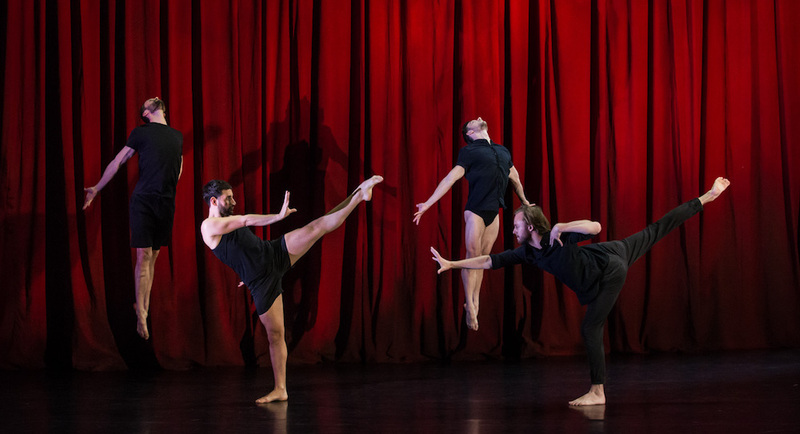 Sydney Dance Company in Rafael Bonachela’s ‘Frame of Mind’. Photo by Pedro Greig. Rafael Bonachela’s Frame of Mind – here with a simple red and brown, slightly diagonal curtain design evoking the original set — was also gripping and compelling. It is a room of melancholy and memory, where time is in constant flux and the inhabitants seek to escape but can’t. The dancers were all in black costumes, each slightly different. With its driven energy and relentless rhythm, Frame of Mind is perhaps reminiscent of Stravinsky’s Sacre du Printemps. Bonachela’s acrobatic, athletic, incredibly intricate and demanding choreography requires apparent bonelessness combined with fluid, yet sharp and controlled, precision. It is a haunting, abstract mood piece but simultaneously sleek and dynamic with a sinuous, sculptural line. The striking score from Bryce Dessner (of American hit rock band The National) was written as a musical evocation of home and flight and here recorded by the renowned Kronos Quartet. The entire company of dancers are mesmerizing and pulsating in union, then fracture into short duets and trios and writhing, swirling currents. At times, the stage seems almost overfull and extremely busy. 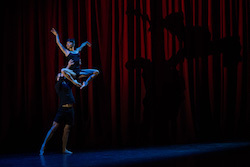 The music builds to a frenzied, relentless crescendo, the dancing being driven by this, before becoming a short, lyrical and tender duet that turns into dangerously acrobatic spins, throws and catches. Some of the dancers loom and observe all of this in the shadows. 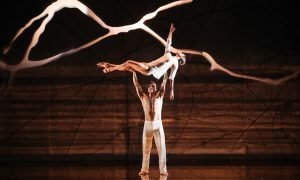 In several sections, the dancers are diving and leaping with superabundant energy. Then, there is a sudden emergence of a frozen line-up starkly light, and the dancers stare intently at us in the audience. After a fluidly elegant solo, Cass Mortimer Eipper brings the work to a taut conclusion, arm across his eyes. 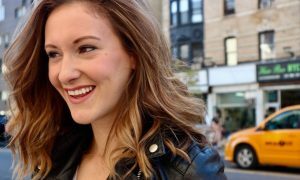 Studio Expansion Vlog: What feels clunky in your studio?